formatting changes to enhance readability. but CSI's links are constantly changing/breaking. NOTE: The original edited and translated version of Carl von Clausewitz: Two Letters on Strategy was published earlier by the U.S. Army War College Art of War Colloquium in November 1984. This edition has retained the editing style of the original. The present text, however, rejoins the original letters into whole documents, contradicting what the translators indicate as their intentions in paragraph 3, "A Note on the Text," page 7. Professor Paret has granted his kind permission to allow us to revise the first pages of Clausewitz's text in accordance with the translation found in Peter Paret, Understanding War: Essays on Clausewitz and the History of Military Power (Princeton, 1992). The portrait of Clausewitz is taken from a lithograph in the possession of Peter Paret. The portrait of Roeder was originally published in the fifth volume of Kurt von Priesdorff, Soldatisches Führerrum, [1938?]. The page of Clausewitz's letter of 22 December 1827 was first published as an example of Clausewitz's handwriting in Rudolf von Caenunerer, Clausewitz, Berlin, 1905. Copyright © 1984 by Army War College Foundation, Inc. The introduction, copyright © by Peter Paret, 1984. This edition of Carl von Clausewitz's Two Letters on Strategy was made possible by the Army War College Foundation and by the Art of War Colloquium of the Army War College, which sponsors the volume as part of its program of republishing military classics for the professional development of the officer corps. The Army War College wishes to express its gratitude to the co-editors and translators, Professor Peter Paret, Spruance Professor of International History at Stanford University, and Dr. Daniel Moran. In recent years, Carl von Clausewitz's On War has attracted many new readers in this country, stimulated in large part by the publication in 1976 of a new translation and edition of the work by Professors Michael Howard and Peter Paret. 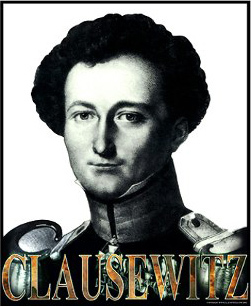 Generally readers have concentrated on Clausewitz's philosophy, theory, and strategic concepts, as developed in Books One, Two, Three, and Eight of On War. His views on operations, on the other hand, have been largely neglected. The present work provides us with an opportunity to study Clausewitz's thinking on operational issues in a specific strategic context. Strategic, operational, and tactical levels are the broad divisions of activity in preparing for and conducting war. Military strategy employs the armed forces of a nation to secure the objectives of national policy by applying force or the threat of force. Military strategy sets the fundamental conditions for operations. The terms in parenthesis are used today to describe these levels. In Book Three, Chapter Two of On War, Clausewitz lists the elements of strategy: moral, physical, mathematical, geographical and statistical (logistics).6 In Book Four, Chapter One, he calls them the operative elements in war.7 He states that strategy "presents extraordinary difficulties, and it is fair to say that very few people have clear ideas about its details. "8 Clausewitz then goes on to list some of the obvious facts about strategy: "that success is always greatest at the point where the victory was gained, and that consequently changing from one line of operations, one direction, to another can best be regarded as a necessary evil, that a turning movement can only be justified by general superiority or by having better lines of communications or retreat than the enemy's; that flank-positions are governed by the same consideration; that every attack loses impetus as it progresses. "9 Books Six and Seven of On War cover the conduct of operations within a theater, discussing such concepts as base of operations, lines of communications, and turning movements. Two Letters on Strategy relates these concepts to a particular campaign plan. Two Letters on Strategy expands on many of the ideas expressed in On War, particularly those that deal with campaign plans. For this reason, Two Letters on Strategy should be of value to the US Army in its effort to study large unit operations. This work deals with the positioning and maneuver of corps as well as the evaluation of campaign plans. Although written for a hypothetical situation in 1827, the principles discussed are as timeless as those covered by Clausewitz in On War. The serious reader must follow the text on the maps at the back of the volume in order to understand the arguments put forward by Roeder and Clausewitz. The relationship of time, distance, and mass in these problems and solutions can only be appreciated through a knowledge of the geography of this theater of operation. References to On War in the introductory material and in the endnotes are to the revised and expanded edition by Michael Howard and Peter Paret, published by Princeton University Press in 1984. 1. Carl von Clausewitz, On War, rev. ed., edited and translated by Michael Howard and Peter Paret, Princeton University Press, 1984, p. 70. 2. Field Manual (FM) 100-5, Operations, Department of the Army, Washington, D.C., 20 August 1982, p. 2-3. In the German Army, then, starting in the general staff, the employment of the term 'strategisch' (strategical) has fallen more and more into disuse. We replace it, as a rule, by the term 'operativ' pertaining to operations and thereby define more simply and clearly the difference from everything that is referred to as 'taktisch' (tactical). All that pertains to operations as such takes place, on the whole, independently of actual combat, whereas in the term 'strategisch' (strategical) things become easily confused, as has been proved by the example of our enemies who are wont to speak of strategical conditions when it is merely a question of purely local matters. At any rate, the term 'strategy' ought to be confined to the most important measures of high command. Baron von Freytag-Loringhoven, Generalship in the World War, translated by the Army War College, Washington, D.C., 1934, p. 34. In 1827 the Prussian general-staff officer, Major von Roeder, requested Clausewitz's comments on solutions of two operational problems that had been set by his superior, Lieutenant-General von Müffling, Chief of the General Staff. Müffling, best known for his service as Prussian liaison officer in Wellington's headquarters during the Waterloo campaign, never freed himself from the cautious strategic concepts current in the Prussian Army before 1806. Position warfare and the occupation of territory dominated his thinking, rather than the defeat of the enemy's forces. But he was an efficient peacetime chief of staff, who took the training of his officers seriously, and whose operational exercises, war games on the map and on the ground, and innovations in communications and map-making, contributed to the growing professionalization of the general staff. At the time, the general staff was still far from the army's central planning and, in effect, executive organ it became some forty years later under Moltke. In 1821 it had been detached from the Ministry of War; but the Chief of Staff continued to report to the minister on all major business, and his right to report directly to the monarch was severely circumscribed; he was still an advisor, who responded rather than initiated. The staff itself was small for a major power with a peacetime army of some 127,000 officers and men, which could be expanded to over 400,000 if the reserves were called up. The central body, or Great General Staff, in Berlin numbered 19 officers, including the chief; 27 officers served with the guards, the eight army corps, and the artillery inspectorate general. Five officers holding other assignments were attached to the staff and kept informed of its work, though they participated in it only when their special expertise was needed. The senior in this group was Clausewitz, since 1818 Director of the War Academy. While not a man of striking originality, Roeder was an intelligent officer, broadly experienced as a planner and in the field. His early association with Scharnhorst and other members of the reform movement left a permanent mark on his ideas and attitudes. He was one of the men who carried a hint of the reform era's idealism and independence of judgment to the army's peacetime routine in the sluggish, conservative decades after 1815. His memoirs indicate that he looked up to Clausewitz, who in turn liked him and--as the following letters show--trusted him sufficiently to express his opinions at length and frankly, to the point of openly criticizing Müffling's operational and strategic views. The problems Müffling assigned to Roeder and others on the staff toward the end of 1827 were, like the majority of his exercises, defensive in nature. Prussia had become a major power, her territory now stretching from the Niemen and the Republic of Cracow in the east to the Rhine and beyond in the west; but larger, richer, better armed neighbors lay on her borders. Neither a preventive strike nor an offensively waged defensive were part of Müffling's thinking. In any future war, he expected "an enemy to invade Prussia from west, east, or south. Political weakness [would] compel Prussia to fight on the defensive on her own territory. "3 Within these constraints, Roeder worked out his answers, and then forwarded Müffling's exercises to Clausewitz, together with his solutions and a solution to the first problem by another officer, who signed himself merely with the initial M-possibly First-Lieutenant Count Monts of the Great General Staff. The opening paragraphs of Clausewitz's letter of the 22nd criticize Müffling's first problem for its failure to indicate the political purposes of the antagonists, and to establish the level of significance the military operations possessed for the opposing governments. Without this information, sensible strategic and operational planning was out of the question. That this was not mere pedantry on Clausewitz's part, that a limited conflict between Prussia and Austria lay as much in the realm of the possible as the desperate struggles of the Silesian and Seven Years Wars, is shown by the Campaign of 1778, the so-called "Potato War," between the two powers, which consisted primarily in feints and armed demonstrations while a diplomatic settlement was worked out. Then, and at all times, political interest largely determined-or should determine-the scale and type of military effort. In the rather casual context of a private letter to a younger comrade, Clausewitz tests and applies hypotheses that eventually receive their ultimate formulation in the polished, compact prose of the revised opening chapter of Book I of On War. Since Clausewitz wrote in reaction to Müffling's exercises, his letters focus on problems of defense, a circumstance that led the German editor, when the letters were published in Berlin in 1937, to give his edition the subtitle Thoughts on Defense. Actually, their scope is far broader. Among important themes - besides the political nature of war - are Clausewitz's arguments for the need for flexible planning, balancing the geographic, economic, and social givens with the constantly changing political situation, the strengths and weaknesses of the political and military leadership, and other imponderables; his thesis of the reciprocal relationship of attack and defense; his rejection of Müffling's static doctrine in favor of an aggressive, active defense. Another recurring theme is the dismissal of pet phrases such as "freedom of action" or "mobile operations," which he feared were too often substitutes for hard thinking about the realities of specific situations. Today, over a century-and-a-half since the exchange between Clausewitz and Roeder, we recognize the two letters as a valuable gloss on major themes of On War. That On War does not, and should not, contain the kind of extensive, systematic analysis of a particular operational problem that is developed in the letters, further increases their significance. Certainly, in many respects war has changed almost beyond recognition. But the reader who takes the trouble to imagine the realities of war at the beginning of the industrial revolution, will find Clausewitz's analysis interesting in its own terms. Beyond that, the two letters suggest how Clausewitz might have dealt with the different and yet related problems of war today and in the future. If we take account of the technological and tactical conditions of the 1820s, and think or play through the strategic and operational solutions Clausewitz proposes to Roeder, we will find ourselves face to face with the theorist in his workshop. In new form we encounter, and perhaps come to understand better, the interaction of practical knowledge, political and psychological insights, and the ability to abstract and generalize without ever departing from the hard facts, that lies at the core of Clausewitz's unique and lasting achievement. 1. The figures, which do not precisely coincide with the number of positions authorized at the time, are taken from the Army List for 1827: Rang- und Quartier-Liste der Königlich Preussischen Armee, Berlin, 1827. 2. Roeder's memoirs, Für Euch, meine Kinder!, published posthumously in Berlin in 1861, are an interesting source for the conduct of operations in the Prussian army from the perspective of a junior staff officer. They repeatedly mention Clausewitz; see, for instance, pp. 56, 305, 306, 314, 315, and 319. 3. Herbert von Böckmann, "Das geistige Erbe der Befreiungskriege," in Von Scharnhorst zu Schlieffen, ed. Friedrich von Cochenhausen, Berlin, 1933, p. 122. Böckmann's essay contains a good analysis of Müffling's ideas. See also "C. v. W." [i.e. Philipp Friedrich Karl von Müffling], Betrachtungen über die grossen Operationen und Schlachten der Feldzüge von 1813 und 1814, Berlin and Posen, 1825; and the discussion of Müffling as Chief of Staff in Kurt von Priesdorff, Soldatisches Führertum, IV, Hamburg, [1937? ], pp. 313-18. 4. Carl von Clausewitz, "Note of 10 July 1827," On War, rev. ed., edited and translated by Mchael Howard and Peter Paret, Princeton, 1984, p. 69. 5. For a more extensive discussion of Clausewitz's thinking at the time he received Roeder's letter, see Peter Paret, Clausewitz and the State, Oxford and New York, 1976, pp. 378-81. Our edition is based on Zwei Briefe des Generals von Clausewitz: Gedanken zur Abwehr, a special issue of the Militärwissenschaftliche Rundschau, a periodical published by the Ministry of War and the General Staff of the Army, Berlin, 1937. The editor of the issue was not identified. The originals of Clausewitz's letters were in the possession of the General Staff archives (Kriegsarchiv des Grossen Generalstabes, Manuskripte, Kap. IV, Nr. 243), and disappeared or were destroyed during the Second World War. The German edition printed Clausewitz's letters verbatim, but modernized his orthography and made a few changes in his punctuation. Müffling's problems and the solutions by Roeder and M were partly quoted, partly paraphrased. We have translated all quoted material, but have restated the paraphrased passages in our own words. With some adjustments, we have adopted the German editor's practice of printing Clausewitz's letters in sections, each part after the text by Müffling, Roeder, and M to which it refers. [*See note on page vi.] The arrangement involves neither deletions of, nor changes in, Clausewitz's wording, but should assist the reader in following his argument. Clausewitz's German, though precise and supple, is sufficiently complex to demand a relatively free translation. He wrote in the sophisticated idiom of the Goethe period, many of whose terms and expressions have undergone some change in meaning in the intervening century-and-a-half, and should not be translated literally. To convey the logical and rhetorical links between sentences, which reflect Clausewitz's dialectic, often calls for the substitution of words or the rephrasing of sentences. In a very few instances, which we mark, we were unable to resolve an ambiguity of meaning. Occasionally, to clarify an antecedent or the meaning of a term, we have added an explanatory word or two in brackets. Several footnotes were taken over from the 1937 German edition, and identified as such. The remaining notes, signed "Eds.," are by the present editors. Italicized words and phrases are Clausewitz's own. Brief passages from the opening part of Clausewitz's first letter are quoted in Peter Paret, Clausewitz and the State, Oxford and New York, 1976, pp. 379-80; and in the same author's "The Genesis of On War," in Carl von Clausewitz, On War, rev., ed., edited and translated by Michael Howard and Peter Paret, Princeton, 1984, p. 7. A longer segment from the same letter is printed as an appendix in Alexander Atkinson; Social Order and the General Theory of Strategy, London, 1981, pp. 284-92, a version that is close to a literal translation and consequently contains numerous errors and infelicities. These segments aside, the present edition, to the best of our knowledge, is the first publication of the material in English. Relations between Austria and Prussia are strained. Saxony is allied to Austria. Austria has assembled her forces in Bohemia, Moravia, and her German territories, and established magazines in Komotau, Aussig, Gabel, Arnau, and Jung-Bunzlau. Prussia has mobilized the Guards; the 2nd, 3rd, 4th, and 6th Army Corps; and the Silesian Division of the 5th Corps.1 The fortresses at Erfurt, Magdeburg, Wittenberg, Torgau, Küstrin, Glogau, Schweidnitz, Silberberg, Neisse, and Kosel are supplied for six months. On June 1 news arrives that the Austrian forces on the Danube have set out for Bohemia. It is certain that Austria will take the offensive once these units have reached their destinations. Austrian strength is assumed to be 130,000 men; Saxon strength, 20,000. Prussia can put five corps (150,000 men) in the field. An additional half a corps and some reserve formations will garrison these fortresses that are threatened. a) Possible operations by Austria and her ally. b) Analysis of these in time and space. c) Which operation is most dangerous to Prussia? d) The overall disposition of Prussian forces, from which each of the Austrian moves can be countered. e) A detailed assessment of each possible operation, paying particular attention to the one deemed most dangerous. The Austrians can advance 1. through Silesia; 2. between the Oder and the Elbe, along the shortest route to Berlin; or 3. along the left bank of the Elbe. Inferior to these three main options "are all others, which seek to achieve their purpose by [dividing the army into] a main and a subsidiary force." The first option is improbable because it compels Austria to reveal her intentions sooner,(1)2 lose "all advantages of the initiative," (2), and concede the occupation of Saxony, and perhaps also of parts of Bohemia, in exchange for Silesia. The second option is the most likely, because if Prussia places great value on protecting Berlin, she is forced into "the most disadvantageous defensive" (3). The Third option is "totally unthinkable," because the enemy advancing along the left bank of the Elbe below Torgau lacks an operational objective. An Austrian advance from Vienna through Silesia covers 678 kilometers. After the Austrians cross the Silesian border, their further intentions would become known in Berlin on about the 15th day of the operation. An advance between Oder and Elbe covers 542 kilometers. The Austrians leave Bohemia on the 14th day, and enter Prussian territory on the 19th. Their further intentions would become known in Berlin on the 20th day. In the third case, an offensive along the left bank of the Elbe covers 633 kilometers. If the enemy advances over Leipzig, and intends to cross the Elbe at Dessau, he will reach Bitterfeld, halfway between the Prussian frontier and Dessau, on the 22nd day (4). The course of the Elbe from Bohemia to Wittenberg is nearly the same as the route to Berlin. Torgau lies 113 kilometers from the point where the Elbe crosses the Bohemian-Saxon border, and 113 kilometers from Berlin. The Austrians can move a siege train by barge to Torgau, a very considerable advantage for them. If they base their operations on this possibility, this is the plan that poses the greatest threat to Prussia (5). The Austrian columns could advance on both banks of the Elbe, with pontoon bridges between them, until they combine at the Prussian border and operate jointly, something "the defensive system" (6) cannot prevent. It follows from this a) that the Prussian army cannot take up positions far from Torgau (7), and b) that it should not be pushed forward to the Saxon border, so that "under all circumstances it retains its freedom of action"(8). The general deployment of the Prussian army should be as follows [map 2]: the 4th Corps at Eilenburg, the 3rd Corps at Torgau, the 2nd Corps at Herzberg, the available units of the 5th Corps at Schlieben, the Guards at Zossen, one half of the 6th Corps at Dobrilugk, the other half of the 6th Corps will garrison the Silesian fortresses, and initially is stationed at Neisse [the Silesian town (see map 1), not the river of the same name. Eds.]. If the Austrians enter Silesia (1st option), the Prussian right wing is given the mission to occupy Saxony, while the main body of the army moves east to the Bober River, and for the time being remains on the defensive. After Saxony has been overcome, an offensive can be launched against the Austrian advance in Silesia. In the second case, an Austrian advance between Oder and Elbe, the Prussian army concentrates between Torgau and Herzberg. If the enemy bypasses it as he advances on Berlin, which would be unlikely, the Prussian army remains based on the Elbe (9), and attacks his rear. In the third case, an Austrian advance on the left bank of the Elbe, the Prussian army assembles on the right bank, its right flank at Wittenberg, its left at Torgau. In this impregnable position, with a bridgehead at each wing, the commanding general would be free to seize the initiative as soon as he deemed it appropriate (10). If, however, the enemy advances on both banks of the Elbe, the best area of concentration for the Prussian army would be at Herzberg. If the Austrians remain divided, the advance on the right bank should be attacked, since it presents the greater threat. If the Austrians unite on the right bank, the fortresses at Torgau and Wittenberg, as well as the Elbe and Elster rivers, offer ample opportunity for mobile operations, until the time has come to offer battle. These recommendations presuppose that the loss of Berlin would have no impact on the outcome of the war, and if necessary could be tolerated by Prussia. If the Prussian army were ordered to cover Berlin, which would mean withdrawing from the advantageous position on the Elbe, its situation would become critical. For instance, a position at Luckau, with the left wing on the Spreewald, would leave the right wing dangling (11). The enemy could deny the Prussian army all freedom of movement (12), or compel it "to resort without hesitation to battle" (13). A general who wished to risk nothing could withdraw behind the Nuthe and Notte rivers, but would then be thrown so completely on the defensive that the enemy could immobilize him there, while laying siege to Torgau. (14). It would be very difficult to relieve the fortress. In conclusion, if the army withdraws from the Elbe, it would not be possible to devise any truly promising defensive strategy for it. If, on the other hand, the commanding general understands how to exploit the river position, Austria "can achieve lasting advantages only by winning a major battle" (15). The Austrian army can advance 1. on the right bank of the Elbe, over Rumburg and Zittau through Lusatia toward Berlin; 2. over the Erz Mountains on the left bank of the Elbe into Saxony; or 3. through Silesia. The Saxon army will probably assemble at Dresden, or, if the Prussians enter the country before the Austrians, withdraw into or behind the Erz Mountains, or entrench itself around Dresden. In all circumstances it seems advantageous for the Austrians to join up with the Saxons as soon as possible, and either the first or the second option would bring about an early junction. Of these two options, the advance on the right bank of the Elbe through Lusatia appears the more decisive(1)3 since it is the shortest route to Berlin, and is free of Prussian fortresses, which would be difficult to bypass or whose investment would require detaching troops from the advance. The second option lacks a definite objective. The Austrians would probably choose it only if they wish to avoid battle at the beginning of the campaign, and find it sufficient to control Saxony and the left bank of the Elbe, and possibly to invest Erfurt (2). In the third option, the Austrian objective could only be to invest some of the Silesian fortresses. In that case, the Prussians will certainly advance and force a battle. Even were the Austrians to win this battle, they would still not gain the advantages they might derive from the first option (3). As to the time required for these operations: In the first case (a march through Lusatia), the enemy could reach Hoyerswerda on the 21st day after leaving the Danube. In the second case (an advance on the left bank of the Elbe), he would reach the Erz Mountains before Dresden on the 20th day. In the third case (an attack on Silesia), if the enemy were to move through Trautenau, he would reach Landeshut on the 17th day. These estimates make no allowance for opposition. The situation would be different if even weak Prussian detachments were to occupy the mountains, and harass the enemy along his frontier or on the march. "It must be apparent that the attack on Berlin through Lusatia presents the greatest danger to Prussia, since, as mentioned above, it takes the shortest route to the capital, through an area without fortresses"(4). In considering how Prussia might best counter each of these threats, we must leave out of account the possibility that Prussian units stationed near the border enter Saxony and occupy the mountains before the Austrians. A preventive strategy is excluded by the nature of the exercise, which stipulates that Prussia must await the Austrian offensive. Consequently it is proposed that the main Prussian force (the Guards and the 2nd and 3rd corps) deploys between Hoyerswerda, Senftenberg, Spremberg, and Kalau [map 2]. The 2nd Corps, particularly its Landwehr units, would of course arrive later than the others. The 4th Corps assembles between Elsterwerda and Mückenberg behind the Black Elster River, the Silesian Division of the 5th Corps at Görlitz. The line units of the 12th Division (6th Corps) march to Landeshut, while its Landwehr units garrison the Silesian fortresses [off map 2, south-east of Görlitz]. 1. The division stationed at Hoyerswerda send out a strong cavalry reconnaissance toward Bautzen, which takes up positions approximately halfway to the town. It is not to become involved in a decisive action, but return to Hoyerswerda if it encounters superior forces (6). 2. Reconnaissance detachments will be sent out from Senftenberg, Mückenberg, and Elsterwerda. 3. The division at Senftenberg will deploy east behind Hoyerswerda. 4. The 4th Corps, stationed between Elsterwerda and Mückenberg, will deploy east between Mückenberg and Senftenberg, while continuing to hold the river-crossing at Elsterwerda. 5. The line units of the 2nd Corps, having in the meantime arrived at Luckau, will continue south to Alt-Böbern, and join forces with the Guards. 6. The corps at Görlitz is ordered to engage weaker enemy forces, avoid stronger formations, and keep open its line of retreat into Silesia (7). If the Austrians press their offensive toward Berlin, they will be met by three-and-a-half corps (the Guards, 3rd and 4th corps and the line units of the 2nd Corps), while the Görlitz corps operates on their right flank. The terrain will determine where the main Prussian army gives battle, and circumstances will dictate whether it is opportune to await the arrival of the Landwehr of the 2nd Corps. If that seems necessary, the battle could be fought between the Nuthe and Notte rivers, or perhaps already at Luckau. Should the Austrians choose the second option (an advance on the left bank of the Elbe), they might cross the Elbe at Dresden. The main Prussian army would then block their way behind the Black Elster River, and the Görlitz corps would operate against their right flank. If, on the other hand, the enemy proceeds further along the left bank, the 4th Corps stands ready at Torgau, the rest of the main army withdraws to the area around Torgau-Herzberg, with the Görlitz corps at Elsterwerda. If the Austrians were then to cross the Elbe above Dresden, which is unlikely, they should be attacked. If they do not cross, the Prussian forces on the right bank must follow the enemy's movement on the left until the Landwehr of the 2nd Corps arrives, and then take the offensive. In the event the Austrians proceed over Trautenau to Landeshut (the third option), their objective would be to lay siege to the Silesian fortresses. To cover the siege, they would probably deploy along the Katzback River [map 1]. The Prussians respond as follows: The units of the 12th Division at Landeshut withdraw to Schweidnitz, to obstruct the enemy advance as much as possible. "Depending on circumstances,"' they would then "reinforce the threatened fortresses, and conduct mobile operations among them" (8). The Görlitz corps confronts the enemy between the Bober and Katzback rivers, while the main army moves east to join it (9). In the event that a secondary enemy column is pushed through Zittau, all or part of the Görlitz corps remains in place against it. An advance between the Oder and Bober rivers is unlikely, nor would it be dangerous, since its left flank would be exposed to counterattacks. Whether a battle should be fought before the Landwehr of the 2nd Corps arrives from the north by way of Guben, or whether battle should be avoided until their arrival, depends on circumstances that cannot be determined in advance (10). You have asked me, dear friend, to give you my opinion of the strategic problems and the two solutions you have sent me. I do so with the understanding that you will treat my communication, which is made purely in the interest of scholarship, as entirely confidential. War is not an independent phenomenon, but the continuation of politics by different means. Consequently, the main lines of every major strategic plan are largely political in nature, and their political character increases the more the plan encompasses the entire war and the entire state. The plan for the war results directly from the political conditions of the two belligerent states, as well as from their relations to other powers. The plan of campaign results from the war plan, and frequently-if there is only one theater of operations-may even be identical with it. But the political element even extends to the separate components of a campaign; rarely win it be without influence on such major episodes of warfare as a battle, etc. According to this point of view, there can be no question of a purely military evaluation of a great strategic issue, nor of a purely military scheme to solve it. That it is essential to see the matter in this way, that the point of view is almost self-evident if we only keep the history of war in mind, scarcely needs proof. Nevertheless, it has not yet been fully accepted, as is shown by the fact that people still like to separate the purely military elements of a major strategic plan from its political aspects, and treat the latter as if they were somehow extraneous. War is nothing but the continuation of political efforts by other means. In my view all of strategy rests on this idea, and I believe that whoever refuses to recognize that this must be so does not yet fully understand what really matters. It is this principle that makes the entire history of war comprehensible, which in its absence remains full of the greatest absurdities. How then is it possible to plan a campaign, whether for one theater of war or several, without indicating the political condition of the belligerents, and the politics of their relationship to each other? Every major war plan grows out of so many individual circumstances, which determine its features, that it is impossible to devise a hypothetical case with such specificity that it could be taken as real. We are not referring simply to trivialities, but to the most important issues, which nevertheless have almost always been ignored. For instance, Bonaparte and Frederick the Great are often compared, sometimes without keeping in mind that one man ruled 40 million subjects, the other 5. But let me call attention to another, less noticeable and yet very significant distinction: Bonaparte was a usurper, who had won his immense power in a kind of perpetual game of chance, and who, for the greater part of his perilous career, did not even possess an heir; while Frederick the Great disposed of a true patrimony. Had nature given both men identical psychological qualities, would they have acted in the same manner? Certainly not, and that alone makes it impossible for us to measure them by the same standard. In short, it is impossible to construct a hypothetical case in such a way that we can say that what was left out was not essential. We can of course think of many characteristics of the opposing armies and states that are identical, and have the effect of canceling each other out; but solving such problems would be no more than a useful exercise. Our best solutions could not be applied to real conflicts. If, therefore, such exercises allow us to leave many things out of consideration because we believe they neutralize each other, we still cannot ignore those conditions that have brought about the war and that determine its political purpose. The political purpose and the means available to achieve it give rise to the military objective. This ultimate goal of the entire belligerent act, or of the particular campaign if the two are identical, is therefore the first and most important issue that the strategist must address, for the main lines of the strategic plan run toward this, goal, or at least are guided by it. It is one thing to intend to crush my opponent if I have the means to do so, to make him defenseless and force him to accept my peace terms. It is obviously something different to be content with gaining some advantage by conquering a strip of land, occupying a fortress, etc., which I can retain or use in negotiations when, the fighting stops. The exceptional circumstances in which Bonaparte and France found themselves since the Wars of the Revolution, allowed him to achieve major victories on almost every occasion, and people began to assume that the plans and actions created by those circumstances were universal norms. But such a view would summarily reject all of the earlier history of war, which is absurd. If we wish to derive an art of war from the history of war -and that is undoubtedly the only possible way-we must not minimize the testimony of history. Suppose we find that out of fifty wars forty-nine have been of the second kind- that is, wars with limited objectives, not directed at the total defeat of the enemy -then we would have to believe that these limitations reside in the nature of war itself, instead of being in every case brought about by wrong ideas, lack of energy, or whatever. We must not allow ourselves to be misled into regarding war as a pure act of force and of destruction, and from this simplistic concept logically deduce a string of conclusions that no longer have anything to do with the real world. Instead we must recognize that war is a political act that is not wholly autonomous; a true political instrument that does not function on its own but is controlled by something else, by the hand of policy. In light of this discussion, I have no need to prove that wars exist in which the objective is even more circumscribed - a bare threat, armed negotiations, or in the case of alliances, the mere pretext of action [by one of the allies]. It would be unreasonable to maintain that such wars are beneath the art of war. As soon as we concede that logically some wars may not call for extreme goals, the utter destruction of the enemy, we must expand the art of war to include all gradations of military means by which policy can be advanced. War in its relation to policy has above all the obligation and the right to prevent policy from making demands that are contrary to the nature of war, to save it from misusing the military instrument from a failure to understand what it can and cannot do. Consequently I must insist that the military goals of both sides are stated whenever a strategic plan is drawn up. For the most part these goals arise out of the political relations of the two antagonists to each other, and to other states that may be involved. Unless these relations are outlined, a plan can be nothing more than a combination of temporal and spatial relationships, directed toward some arbitrary goal-a battle, siege, etc. To the extent that this goal cannot be shown as necessary or superior to others, it can be challenged and contradicted by other projects, without these coming any nearer the absolute truth than did the first plan. That is, indeed, the history of all strategic discussions until today. Everyone rotates within some arbitrary circle. No one tries to push his argument back to the origins of the war that is to be fought, to its true motive, to the one and only point where the logical development and conclusion of the military operations can alone originate. Whatever correct and effective strategic decisions are made, result from the instinctive tact of talented commanders, who with a glance penetrate and assess a mass of circumstances. This instinct suffices for action, but obviously not for analysis, even though action is something far greater than the laborious unfolding and laying bare of facts. You will agree, of course, that in circumstances in which Austria has only enough power to seize some territory with one or a few fortresses, and in which only a modest plan promises success, while a more ambitious one promises none because it disregards the means available, the modest Austrian plan would carry the greatest threat to Prussia. You can see that the question as to which operation is the most dangerous assumes an aura of universality, in this problem as well as in both solutions, that it does not really possess, an error that recurs constantly in a strategic discussion, with the result that general strategic arguments nearly always prove inapplicable to reality. The greatest threat for Prussia can only be determined if we know what the Austrian objective can be or will be. In the present instance this objective must either result from a definition of the overall political situation, or it must be arbitrarily specified as a given of the exercise. Both the problem as well as the solutions ascribe an obscure (that is, unarticulated) importance to the capital city, which in reality Berlin cannot possess. The Seven Years War demonstrated this clearly enough.9 Equally obscure is the notion, involved in the first assumption, that an Austrian thrust through Lusatia would, so to speak, split the Prussian monarchy into two parts, because if our army were defeated and relentlessly pursued, it would have to decide whether to withdraw behind the Oder or escape across the lower Elbe. This would be a serious crisis -but only in the face of an enemy able to carry out such a great project. It can hardly be doubted that for the Austrians such an operation, flanked from Bohemia by Silesia on the right, and on the left by the Elbe fortresses, would be very difficult. It could only succeed if the difficulties were offset by a great preponderance of force. Of this preponderance the problem has nothing to say; it appears on the contrary to assume a kind of equilibrium of strength. Furthermore it seems to me that this problem assigns undue significance to the question as to which Austrian operation poses the greatest threat. Attack and defense determine their measures reciprocally. But surely in theory-that is, for the purposes of general analysis-the sequence of ideas arising from this interaction must start somewhere? Quite so. The sequence begins, I am convinced, with the defensive, in part because peacetime military arrangements are directed primarily toward defense, which thus precedes the offensive; in part because offensive plans depend on the disposition of the defense, without which they would have no factual basis. The defensive, on the other hand, does not lack the necessary data in the absence of an attack, because these reside in the overall character and circumstances of the country. At the general level, then, the main characteristics of defensive operations develop directly out of existing conditions. In specific cases, however, this is by no means always necessary, but only if one cannot discover the enemy's intentions early enough to take the required countermeasures. This certainly does not seem to be the case here. From the direction of their advance, the location of their magazines, the mobilization of their transport, and other information, one would soon learn whether the Austrians were directing their main force toward Silesia or Saxony. Whether they intend to advance along one bank of the Elbe or the other, they might perhaps conceal until the last moment. But this would make very little difference to us since the slightest movement right or left on our part would compensate for it. If, as is most natural with respect, to our peacetime deployment, we assemble our three Silesian divisions at Neisse, Liegnitz, and Sprottau respectively, the Second and Third Corps and the Guards in Lower Lusatia, and the Fourth Corps on the right bank of the Elbe at Torgau, we can await information that we would certainly receive on the, direction of the enemy's main force, and then lead our main force against it. For this reason it seems to me that this particular exercise ranges quite unnecessarily into the realm of speculative reflection. Wherever concrete conditions are decisive, such speculations, which all too often degenerate into hair-splitting, are no longer of interest. If the question of Prussia's greatest military weakness is to be raised, the problem would have to be totally recast. 1. Why would an attack on Silesia reveal Austrian intentions sooner than attacks elsewhere? Because the border is somewhat farther from Berlin? That is too petty and insignificant a consideration to influence the choice of operational lines. If the Austrians set out from Vienna and the Danube toward our border, we will certainly grasp that we are their target, and prepare ourselves to be in the right place at the right time. We would not delay our measures until the Austrians had crossed the frontier. 2. The advantage of initiative here means the advantage of surprise. Only when surprise is present does the initiative confer an advantage; otherwise, in war as in card games, it is a disadvantage.11 This inheres in the nature of things, but for want of space cannot be discussed here. If Berlin is to be surprised, this can certainly be achieved more easily by way of Saxony; if it should be Silesia, that would not be the case. Obviously the Austrians can attack us much earlier in southern Silesia than in the Mark Brandenburg. 3. The reason for the Austrians to prefer an advance on Berlin is that if Prussia places a high value on protecting her capital she will be forced into a most disadvantageous defensive. On the mere possibility that Prussia would make this mistake, the Austrians are supposed to base their line of advance. Again, this consideration is far too insignificant. And why should Prussia's defensive be most disadvantageous? What an empty phrase! A strong position behind the Notte and Nuthe rivers, two fortresses on the enemy's left flank [Torgau and Wittenberg], an entire province [Silesia] on his right -how can anyone call that disadvantageous? I do not say that this is where we should make a stand; I merely want to show that the reason given here itself needs justification. 4. What is the purpose of indicating the three distances from Vienna to Berlin and to two points on the Prussian frontier? At most the figures might be used to determine how far forward we could assemble our forces. But the author does not use them for this purpose, to which, in any case, the distance from Vienna to Berlin would be irrelevant. It seems as though this distance is meant to demonstrate the danger for Prussia of the second option. But the author does not draw this conclusion; rather he believes the danger to derive from something else -the Elbe and Torgau.12 In the end, however, that maneuver [the siege of Torgau] leaves the importance of Berlin quite out of the account. If Berlin really were the keypoint of Prussia's entire, defensive system, its distance from Vienna would not matter very much, since this situation -unlike some other subordinate strategic options - demands more than a mere race.13 That Prussia would not learn the direction of the Austrian offensive until her frontier had been crossed, is an arbitrary, improbable assumption, totally unsuited to provide a premise for strategic analysis. I confess, then, that I find these calculations of time and space unnecessary on the one hand, and without practical value on the other. 5. The fact that Austria can move a siege train by water to Torgau is relevant only to a siege of Torgau. Why it should pose the greatest danger to the Prussian state would first have to be demonstrated. Again this is merely an unsupported assertion. There may be cases when a siege of Torgau would be more dangerous to the Prussian state than a siege of Glatz, but the opposite could also be true. If Torgau is invested without great superiority of force, success would hardly be conceivable. The then becomes the best means for Prussia to gain a general siege strategic victory. So long as the relationship between the two sides is not more fully specified, we cannot really think about these issues in a practical way. My analysis merely tries to show that the proposition on which the author's reasoning rests is, as so very often in strategic theorizing, an entirely unproven thesis, a mere phrase. 6. The Austrians are supposed to be able to proceed safely on both banks of the Elbe until they reach the vicinity of Dresden.14 This is inferred from the defensive system of Prussia. If by this term the author means the Prussian intention to fight the campaign on the strategic defensive, then his inference is false. If circumstances were as described, nothing would be more compatible with this intention than to attack one of the Austrian columns before the two could unite. If the author means a specific defensive system, which might perhaps consist in a deliberate withdrawal, we would have to assume that this system, which incidentally is not mentioned in the assignment, had been betrayed to the Austrians. Otherwise they would always have to accept the possibility of having to pay a price for separating their forces. If we consider that while the Austrians are assembling their army on the Eger, the Prussians assemble theirs on the Elster, it is hard to predict with certainty who would arrive first in the vicinity of Dresden. And I doubt that the Austrian commander would risk an advance in two columns on both banks of the Elbe. Instead of envisioning the situation of both armies shortly before the campaign begins, and asking what the most advisable course of action for each would be, a general concept, namely the concept of the defensive, once again is taken as the basis for a conclusion that is not only without practical value, but also inherently wrong. 7. The conclusion the author now draws, that the Prussians should place themselves near Torgau, again seems entirely illogical to me. It is not clear why the Prussians could not occupy more advanced positions and withdraw from them in time to concentrate on Torgau. Besides, the conclusion assumes an intention that must at least be discussed, since it is by no means inevitable -I mean the intention of the Prussian commander to cover Torgau and prevent a siege. Far from being a universal necessity, this intention is fundamentally contrary to the nature of things. Fortresses exist to be besieged. A siege weakens the enemy, and hastens the moment when we can defeat him more easily. This is a natural sequence in theory, and in all wars fought over major issues it is also the natural course of events. On the other hand, in limited wars, the play of balanced forces frequently causes armies to cover fortresses. The history of war is full of examples. It would take me too far afield to disentangle this seeming anomaly here, and to show that it is entirely, natural and justified. I only assert that in the present case this intention [of preventing a siege of Torgau] is not justified, and cannot be conceded as a general, self-evident necessity. 8. What does it mean to say that the Prussian army should retain its freedom of action? Obviously the farther forward its position, the greater its freedom of action, since by advancing it will increase the number of possible lines of retreat in its rear. The phrase "freedom of action" is among the most pernicious of all strategic cliches, because it is used more often than any other, and no one feels obliged to define its actual meaning. In general, then, the author concludes that the best position for the Prussian army lies between Herzberg and Torgau, where, in one way or another, it can offer the most effective resistance. I have no wish to criticize this conclusion in and of itself, only to point out that it bears little or no relation to the author's construct of strategic theorizing and calculations of time and space. The Prussian army is strong in this position because of the Elbe, the three fortresses, the sheltered character of the whole deployment, and because the Silesian border runs parallel to the enemy's lines of communication. These things can be said in a few words, sound common sense will accept them, and require no ingenious, long drawn-out strategic deduction. 9. Since so few facts are given [in the problem], it is impossible to determine whether a flanking position with our back to the Elbe would be superior to any other. The Prussian army appears to find itself in such an excellent strategic position here that it can evade an attack in three directions toward the Elbe, toward Berlin, and toward Silesia -and still retain the advantage of posing a strategic threat to the enemy, either on his two flanks or in his rear. Nevertheless, the army's main line of retreat should certainly be determined, that is, the line to be used in case of extreme misfortune, with which all other operational, decisions ought to be correlated. The fact that at Vilna [in 1812] the Russians were still undecided whether to withdraw their main force toward St. Petersburg or toward Moscow nearly led to the disaster of the army's surrender in the open field. If it were considered absolutely necessary to cover Berlin, a flanking position so near the city would not be appropriate. I believe, however, that protecting Berlin is not an essential element of the Prussian defense; consequently in a great many cases, which need of course to be studied in detail, a flanking position would prove highly advantageous. 10. A position behind the Elbe, just as behind any large river, is tactically unassailable. The strength of the position does not depend on the two fortresses. But we do not gain a favorable battlefield by deploying behind the Elbe, because we force the enemy to by-pass us. It is only from this compulsion that our advantages must come. 11. In how many positions do both wings rest on major strategic strong points? To have one such point is already worth a great deal. Once again, the reason why we should not deploy at Luckau, the lack of support for the right wing, is one of those strategic terms that cannot bear close inspection. Whether we might not find some tactical support for the right wing [e.g., some farm buildings, a small rise in the ground, a swamp. Eds.] would have to be discovered on the spot. How many battles are fought in which only one wing of the defender's position is secure! 12. The enemy could no more determine the movement of the Prussian army at Luckau than anywhere else. This is one of the most abominable strategic clichés. Basically it says absolutely nothing, since, after all, the actions and movements of one commander do always strongly influence the conduct and movement of the other. If the statement means anything at all, it can only be that one general can compel the other to follow him everywhere, to submit to him wholly, to deprive him even of the possibility of indirect resistance by means of retaliatory countermovements. This does not in any sense seem to me to hold true for a Prussian army at Luckau, and we may assume that had the author developed his ideas in greater detail, their inadequacy and one-sidedness would have become obvious. 13. Battle is here presented as something evil, at least that battle that is resorted to without hesitation. Here we enter the morass of muddled concepts that made up the general-staff science of the Old Regime. Against a determined enemy, who does not shy away from fighting, battle is the only effective means of resistance. We may fight him under the most advantageous circumstances possible, but we must be resolved to fight. In such cases there is no substitute for battle. If the defender has occupied an exceptionally strong position, he will force the attacker to bypass him. If this position is well-placed strategically, to be bypassed offers an advantage to the defense. But the advantage becomes reality only if it catches the attacker in the process, en flagrant delit, as Bonaparte would say. In short, a battle is inevitable: either a battle in the tactical defensive, if the attacker finds bypassing too dangerous, and therefore proceeds to attack our position; or an offensive battle, if the attacker pursues his [original] objective and risks bypassing our position. If the tactical features and strategic location of the defender's position are so strong that the enemy dares to do neither and gives up his advance entirely, then this success without battle arises only from the strictly necessary presupposition that the defender was in fact prepared to fight. If the attacking army does not advance resolutely, if it does not plan an energetic offensive, if it has taken the field merely to await some favorable opportunity, and will only attempt something should this opportunity arise, then the defense can certainly do likewise. Against such an opponent, the defense may make it its business to avoid battle entirely, to regard it as an evil, and to direct all actions and movements toward ensuring that the advantageous conditions for battle that the enemy seeks will not occur. It is important not to confuse the two cases. To expect favorable results from passive resistance against a determined opponent goes against the nature of things. On the contrary, nothing is so certain as that such an approach would lead to half-measures, wasted time, confusion, and-following this splendid purgatory -to the most complete defeat. All this being said, the advance on Luckau and Herzberg surely suggests that the Austrians are seeking a decisive battle. 14. If the Prussian commander retreats north over Torgau simply to bring this fortress into play, obliging the Austrians to besiege it, and then, after they have been weakened by the siege, to attack them, I would find this most sensible. In that case, however, the Prussian commander has no need to withdraw behind the Nuthe River. Rather he will try to halt behind the Elster. Should the Austrians want to drive him off and force him either to withdraw behind the Nuthe or to give battle, the Prussian commander may prefer to accept battle, even if the enemy had not weakened himself significantly by laying siege to Torgau. In light of the general circumstances there seems to be no reason to shrink from this battle, while a retreat to the vicinity of Berlin would be undertaken only on the most pressing grounds. But even supposing such grounds were present, I would not find the retreat as disadvantageous as the author does. He says that the Prussian commander would be thrown back on the most disadvadvantageous defensive, a well known, ready-made figure of speech from the strategist's workshop.15 If the expression disadvantageous refers to the defense itself, the statement is clearly wrong, for a defensive position behind such a line of marshes as exists along the Nuthe cannot possibly be considered a disadvantage. Should the expression refer to the fact that if the enemy lays siege to Torgau, defensive operations would no longer be appropriate, and would therefore be detrimental, then I cannot persuade myself that our army would find it all that difficult to advance from this position by one route or another to relieve Torgau. 15. Here we must first ask, what is the meaning of leaving the Elbe? Does the author mean, evacuate the entire area, and let the Austrians take Torgau at leisure; or is he merely referring to a situation in which one wing of the army is not at all times covered by the river? Again, unfortunately, we are dealing with jargon, which, as usual, bears only a faint resemblance to well defined, specific concepts. Even a retreat behind the Nuthe would make the subsequent relief of Torgau neither impossible nor very difficult, as anyone will agree who thinks of the numerous ways for doing this that are open to the Prussian army. Only if the Prussians were to take no steps to relieve the fortress, could the Austrians occupy Torgau without a battle and so acquire an enduring advantage. But this is an empty supposition. If, on the other hand, the author means that as long as we retreat at least one day's march from the Elbe, the Austrians would succeed in taking Torgau, he lacks all basis in fact. After all, we can advance from any point to attack them. In general, it is not clear how an attacking army can achieve a permanent advantage over a defending force that is its equal physically and in morale, without defeating it in battle. If such a victory is necessary to the success of the Austrian campaign, this necessity is not a consequence of any particular strategic combination on the part of the Prussians, but follows quite simply from the nature of things. That the author again regards battle as an evil, an incongruity, reflects the same confusion that we have discussed under point 13, above. With this I conclude my remarks on Solution M. I feel only too keenly how cursory they are, and how much they may leave unclear. But to make good these failings, I would need a great deal more time. You see, my dear friend, I have scarcely left any propositions unchallenged that are meant to yield a solution to the problem. It is not so much the solution as this type of arguing that I should feel obliged to attack, were I competent to do so.16 I hate the sort of technical language that leads us to believe we can reduce the individual case to a universal, to the inevitable. Strategists manipulate these terminologies as if they were algebraic formulae, whose accuracy has long been established, brief formulae that may be used as substitutes for the original reality. But these phrases do not even represent clear and definite principles. Rather they are nebulous, ambiguous expressions, whose true meaning remains open to question. This is no accident. Their vagueness is intended, because they did not derive from what is essential and could be presented as universal truth. Consequently the inventors of these terms found it natural to allow a certain latitude in their meaning. After all this, my analysis of your solution will require far less time, I fully approve of its simplicity and realism. You set up no scaffolding of superfluous circumstances; your reasoning is not based on mere clichés. But let me be more specific about particular issues. 2. Your description of this option is accurate. It proves the soundness of your point of view that you characterize the option as a possibility and not simply as an outright error, as does Solution M.
3. This also holds true for the third operational option. But your assertion that for the Austrians a victorious battle would be more advantageous in Lower Lusatia than at the foot of the Silesian mountains is based on the one-sided assumption that the Austrians are in the position to fight a war aiming at major decisions. 4. I have already indicated my objections and qualifications to this assertion. 5. Your calculations of times are simple and sound, without the false implications of the other solution. Such calculations are, of course, always necessary; but in this case they lack the great significance that the problem seems to attribute to them. Nothing is less likely than that the Austrians would march from the Danube to our border in one fell swoop. Therefore we should not be concerned that the Landwehr units of the 2nd Corps would not be available. But that you have emphasized - or rather, mentioned - this possibility makes your calculations superior to those of the other solution, since it is only on account of such possibilities that these calculations are necessary at all. 6. I have nothing to say against the details of our disposition given here, except that such specifics cannot reasonably be required or given in advance. With the information that the enemy has crossed our border will naturally come much other news about the number and strength of his columns. Only then will we decide the details of our disposition. 7. I consider this eccentric deployment the one true fault of your answer.19 In such a confined space, at a moment when a great battle may be expected, a divided deployment is always an error, unless it is justified by a preponderance of force. Nothing can protect such a deployment from the danger that the enemy, with one and the same army, may defeat the separate parts one after another, as the famous campaign of 1796 [Napoleon's, in Italy] with its five distinct phases has shown. Over longer distances such an enveloping form of attack or defense becomes less dangerous, and if distances are really great, as in Russia in 1812, a division of forces may cease to be dangerous at all, and its special characteristic will then naturally become advantageous. In 1813 the distances were fairly large, and yet there was always the greatest danger that Blucher would be overwhelmed by the main enemy army, which, in fact, did defeat Schwarzenberg at Dresden. The enveloping form of attack is always the more decisive, the one that leads to greatest success, but for that reason also the riskier, in which success is less certain. Success and danger always stand side by side, and form the dynamic law of war. If we wish to increase the first, the second rises as well, and it then becomes, a question of whether or not this is in accord with the needs and particular characteristics of our situation. Thus, if our circumstances do not allow us to take great risks, we can increase our success only when danger itself is not great, that is, when we possess a preponderance of physical and moral force. This utterly simple principle, grounded directly in the concepts [of success and danger] themselves, allows for clear and definite solutions in a great variety of strategic questions, over which, in the usual way people argue fruitlessly. It is very tempting, if one of our territories lies to one side or behind the enemy advance, to base a considerable force there. This idea has seduced you, but one must resist. That is not to say that we must give up the advantage of this circumstance entirely. Rather we ought to detach a few small units of rangers, whose combined strength is not so essential to the whole that it could not be spared in a decisive battle.20 In an army of 120,000 men, for instance, 5,000 men would not be missed. But these 5,000, in combination with the forces in the area that they could bring into action-Landwehr units, garrison troops, reservists, etc. -can act very effectively against the enemy's lines of operation. This type of operation against an attacker's lines of communication, which arises, in a sense, automatically as he advances, leaving territory to his left and right that he cannot occupy, is the only kind that offers an absolute advantage. It is a unique advantage of the strategic defensive, but it cannot be achieved by detaching significant forces to act against the enemy's flanks, since those who fight on his flank cannot fight on his front. 8. The division's war of maneuver is one of those miserable catchphrases. You will forgive me if I say that you did not form a clear conception of what this would mean. 9. I believe I have already said that if the Austrians were to advance on Silesia rather than Saxony, we would discover it early enough to assemble our main army in Silesia itself, rather than first in Lower Lusatia. The problem is at fault here. 10. Your conclusion is very sensible, and shows that you regard the major battle from the correct point of view. And now, enough. Perhaps I have already worn you out. If I have now and again failed to make myself understood, or if I have not been able to convince you on every point, we can certainly continue our discussion in person. For the purposes of this exercise, the conditions described in the first problem are modified in several respects. First, it is assumed that the Prussian troops will not cross the Saxon border, but must await the Austrian attack on their own soil. They must therefore forego all offensive operations at the start of the campaign, even though, if time permitted, these might prove most advantageous. Furthermore, it is assumed that the entire Austrian force will advance between the Elbe and Spree rivers. b) all five corps assemble along the Elbe near Torgau: One corps on the left bank, one corps at Torgau, and three corps on the right bank between the Elbe and Black Elster rivers. Roeder addressed the problem by first analyzing the specific steps taken at the beginning of the campaign in each of the two cases; then by comparing the two opening stages of the campaign; and finally by drawing a conclusion from his comparison. If, Roeder argued, Austrians were faced with the Prussian deployment given in the first case (four corps between Senftenberg and Spremberg, the fifth at Görlitz), they would have to leave a significant covering force at Görlitz, perhaps as much as one-and-a-half corps, since the Prussians there threaten the Austrian line of retreat. If the Austrians were to lose a battle, this threat could become particularly dangerous. It would probably be impossible to defeat the Prussians at Görlitz, who would avoid engaging a superior force. (1)21 After detaching the covering force, the Austrians would retain three-and-a-half corps for their offensive. How should they be employed? To bypass the left wing of the main Prussian force with an advance between the Spree and Neisse rivers is out of the question. (2) If they bypass the right wing, the Austrians could cross the Black Elster between Elsterwerda and Senftenberg. But the terrain would be difficult for them, and we could attack them under favorable conditions. If they cross below Elsterwerda, they would have the Elbe and Torgau to their rear, and a battle would probably be fought between Senftenberg and Spremberg. Should the Prussian army lose this battle, it would probably have to retreat to Berlin. A good position can be taken up on the heights near the city; if we did not feel strong enough to accept battle there, we would have to withdraw behind the Havel River. (3) If in the meantime the enemy lays siege to Torgau with half a corps, and we bring up reinforcements, we would outnumber him and could take the offensive. These two defensive plans are comparable in several respects. In either case the enemy must win a battle before he can besiege Torgau. In both cases a Prussian victory would seem to lead to similar results. A Prussian defeat between Senftenberg and Spremberg would take the army further from Torgau, because it would have to withdraw to Berlin. But the retreat would leave the army in touch with the main part of its homeland, and thus with its reinforcements. Stationing one corps at Gör1itz seems advisable, because it would threaten the Austrian flank. The force should, however, be commanded by a skillful, energetic general. If such a man is not available, it would be preferable not to detach the corps. In conclusion, if Görlitz were fortified it would offer a position that combines the advantages of both plans. We would threaten the enemy flank, whatever he might do; we would retain contact with the main mass of Prussian territory; and we would remain free to turn toward Silesia. (9) Of course, we would not benefit to the same extent from the advantages of the Elbe with its two fortresses. The choice of our deployment would also depend on whether we could expect to be reinforced by the 1st Corps from East Prussia, and the 7th and 8th corps from the Rhine. Believing that I had discharged my debt to our friendship by the lengthiness of my remarks if by nothing else, I now see that you call on me for a further exercise. I shall take up pen again, not without the fear that your patience has already been exhausted by my first letter. In that letter I pointed out the extent to which the first problem lacks the specific information that alone would permit a solution that is not wholly arbitrary.22 The second problem is an extension of the first. Admittedly, it is more detailed, not as generalized; nevertheless its terms are such that the specifics I missed in the first exercise would also be very significant here. On the other hand, we see that as the conditions of the exercise are presented in greater detail, the specific arrangements of the enemy assume increasing importance. Since it is impossible to generate all essential facts in a hypothetical exercise, it is evident that the more detailed our account, the more illusory it becomes. We make any number of tacit assumptions, and develop an analysis that in the end might not be relevant to one case in a hundred. Reasoning of this kind may still be useful to train our judgment, of course. But it is clear that such an analysis can never be satisfactorily refuted by equally arbitrary arguments. If we are contentious we won't be able to reach agreement; if we honestly seek a solution we will eventually fall into a disagreeable state of perplexity, in which we might almost despair of the validity of any theory whatever. By positing two different means of execution, and asking you to choose between them, the second exercise expects you to criticize each by means of the other. This seems to me particularly inappropriate since the two approaches differ only in one unimportant point. In any strategic problem, but most especially in those that pose alternatives and ask us to choose between them, I feel the need to reduce the issue to general principles, that is to reveal the relationship between one or the other option and the facts that inevitably result from the nature of the situation. In this way, at least, we can recognize the nature of each measure, and its unique characteristics. In the event that we must execute one scheme or the other in real life, we can then decide for ourselves whether the characteristics of one or the other are better suited to our requirements and circumstances. In short, when we evaluate hypothetical plans, we must suspend final judgment on many points, while on others we can be conclusive, because they violate conditions that are set down clearly enough in the problem. I shall now offer such comments on the various aspects of your analysis. You say that a superior enemy force could not defeat the Prussian corps at Görlitz, or rather, you assume it, and indeed it is no more than an assumption. Both experience and the nature [or logic] of the situation teach us that it is very difficult to avoid a developing battle if we are to maintain contact with the enemy and miss no favorable opportunities. An enveloping attack (what Jomini calls operating on exterior lines) is therefore always very dangerous, and is warranted only by a preponderance of force or the knowledge that the enemy is not seeking a decisive action. Nor can you be certain that the enemy will always keep one-and-a-half corps against your corps at Görlitz. When he is about to attack your main force, he may leave only half a corps there. In any case, the force at Görlitz does not present all that much of a danger for him, since in an emergency he can withdraw to the Elbe and by means of a pontoon bridae cross the river below Dresden as well. The calculations pertaining to the corps at Görlitz are thus extremely uncertain; it would be a mistake to trust them rather than the far safer method of maintaining a unified force. In strategy we must distinguish between outflanking and bypassing a position. It is one thing to envelop a position with individual corps or even with the whole army, and attack it from the flank or rear. It is obviously something quite different to bypass the position in order to pursue the object of the attack, without regard to the enemy being left behind. In the first case, the position retains its strategic effectiveness; indeed, the attack demonstrates that it cannot be ignored, and it only remains for the tactical features of the position to prove their strength. In the other case, the position has lost its strategic effectiveness. It is extremely rare that an attacker can bypass a position that isn't very badly situated. But it is equally rare that a position cannot be outflanked. In most cases the defender must be prepared for this eventuality, and make his arrangements accordingly. A position that is given up because it is being enveloped, is hardly worth taking in the first place. I do not think the Austrians could bypass your position either on the right or the left. They could certainly envelop it more easily on the right than on the left; but you cannot assert that enveloping it on the left would be out of the question. 3. A retreat behind the Havel River would indicate that we intend to base ourselves on the western part of the monarchy. If that were not the case, the move would be entirely inappropriate. 5. If we deploy between the Elbe and the Elster, it would have to be south of Torgau. Hemmed in between two rivers that present real obstacles to movement, the one because of its size, the other by the nature of its banks, places us in a situation in which our lines of retreat are exceptionally limited, a fact that exerts a very undesirable influence on the conduct of battle. If, to take advantage of a [tactically] strong position, we choose to fight in this area, we should at least keep open a line of retreat in Torgau itself. That demands that we deploy south of the town, and not too near to it. 6. Deploying before Torgau, with our backs against the town, like a bridgehead of flesh and blood, would mean needlessly resorting to a measure of despair. Such a position, benefitting from two protected flanks, but with a front that - being convex - is very weak, and which in general restricts the defender to extreme passivity, is suitable only to a force that because of its weakness can no longer stay in field. It has been driven into a corner; its back is against the wall because it is on the verge of giving way before the superior strength of the enemy. 7. A large river, flowing in such a direction that the defense can maintain its lines of communication for several days' march on both banks, certainly offers the defense some favorable opportunities. This is even more true when a fortress with a bridgehead protects his movement from one bank to the other, as Torgau does, and when another fortress, as Wittenberg, some distance to his rear, multiplies the number of options. It seems, indeed, that, at the moment the enemy advances, the defender can avoid battle by crossing to the other side of the river, without ceasing to cover the area through the overall strategic effectiveness of his position. At first glance it is not obvious why this game could not be repeated indefinitely. But, first of all, it must be said that in most cases the strategic value of a position declines markedly when a large river separates the defense from the attacker, since this allows the attacker to divide and maneuver his forces in ways that would not be possible without this barrier. Secondly, it is rare that the lines of communication on both banks of the river are of equal value to the defense, and that either one could be given up at any moment. Thirdly, the retreat of a large army over a bridge across a river is not a trivial act; on the contrary, in the presence of the enemy it is barely possible. Fourth, to break out on the enemy's side of the river, should this become necessary, is no simple matter, even in the vicinity of a friendly fortress. Fifth, and finally, it would be very difficult repeatedly to shift all those elements that constitute the rear of the army into their appropriate positions. For all these reasons, a defender could scarcely cross the river more than, a couple of times, even under the most favorable conditions, before, in his effort to counter the movements and actions of the enemy, a part or the whole of his army would suddenly find itself on the same bank as the attacker. If we apply these considerations to the Prussian army at Torgau, we must agree that advantages could indeed be obtained by skillful use of the Elbe in combination with the two fortresses, whether to avoid battle for a time, or to give it under favorable circumstances. But we cannot say in advance exactly how this might be done, because no hypothetical case can specify all the unique, momentary conditions that give rise to opportunity. It must also be added that we ought not exaggerate the absolute value of these favorable conditions; they merely provide the opportunity for auspicious courses of action. If the Prussian commander does not seize this opportunity with great skill, the advantages of his position would soon disappear. 8. As you have correctly remarked, the position on the Elbe presupposes that the army will base itself on the western part of the monarchy, and give up its connection with the east. Should this not be in accord with the general [political and strategic] circumstances, the position would be unnatural and of doubtful value. It seems to me that overall the difference between deploying behind the Black Elster and at Torgau is not great. If we want to remain realistic, we would have to say that in the event of a major battle, this particular difference would be only a minute factor in the final result. The degree to which both commanders have united their forces for combat, the good planning and skillful conduct of the battle, the perseverance of the commanders, the courage of the troops, their confidence in their leader, the obedience of the subordinate generals-are these not all factors that have greater significance and that affect the outcome more directly? Whether the Russians in 1812 withdrew from Moscow to Vladimir or turned south to Kaluga -this one basic alternative, while not primarily determining the direction of the French retreat, as is sometimes claimed, was nevertheless a matter of extraordinary importance.24 There can be no doubt that the change of a single strategic line may have decisive influence. But we ought not to suppose that it is therefore important whether the Prussians fight at Senftenberg or at Torgau, unless we wish to impute strategic value to things that have nothing to do with strategy. 9. Deploying the main army at Görlitz (assuming the place is fortified), which is your ultimate conclusion, would put the army in a flanking position. Naturally the territory that flanking positions are supposed to cover does not lie directly behind them. Such positions can therefore be adopted only if the army has a very broad base of operations, so that the flanking force retains a line of retreat. That is the case here. But this line of retreat will always be rather constricted, sometimes more so, sometimes less. The danger that the army will be forced into an eccentric line of retreat, away from the main part of its home territory, from the center of gravity of the entire military base, constitutes a grave disadvantage of positions of this kind. The position must make up for this flaw by its very great tactical strength, so that the enemy either cannot attack it at all, being immobilized as it were by its strategic power, or is unlikely to succeed if he does attack. This justifies the flanking position, but we still lack the real reason for it: its strategic effectiveness. If you consider the present case with these points in mind, you will agree that if the army at Görlitz were defeated, it would have to retreat on the highway to Breslau, and would therefore be in danger of being driven south to Silesia. A strategist of the old school would say: in that case the army is lost. I won't, because it would be an entirely unjustified assertion. But you will concede that a thousand serious disadvantages would result from such a retreat. Finally, a strong tactical position has not yet been located in the area around Görlitz, and its strategic effectiveness would not be very great in any case, since the Austrians could base themselves on the Elbe. 1. A Prussian corps, at war-strength consisted of two divisions, one artillery brigade, one Jäger detachment of two companies, and one engineer detachment. A reserve infantry regiment, a reserve Landwehr [second line] infantry battalion, and a reserve Landwehr squadron might also be added. The division consisted of a line infantry brigade and a Landwehr infantry brigade of two regiments each, and of a cavalry brigade. Besides the two regular cavalry regiments, the cavalry brigade probably also included a Landwehr cavalry regiment; at any rate, a corps had a total of four line and two Landwehr cavalry regiments. The artillery consisted of nine heavy artillery batteries, and of three light- or horse-artillery batteries. Ed. of the 1937 German text. 2. Numerals in parenthesis in Ms text were added by Clausewitz. His comments are similarly identified, and refer to the numerals in the text. Eds. 3. Numerals in parenthesis in Roeder's text were added by Clausewitz. His respective comments are similarly identified. Eds. 4. In peacetime, the 2nd Corps was stationed on the Baltic, several hundred kilometers farther away from the theater of operations than the Guards and the 3rd, 4th, 5th, and 6th corps. Eds. 5. Clausewitz writes "wie die sogennannte Strategie," which, taken literally, would make little sense. The rest of the sentence makes it apparent that he is referring to the "science" or "discipline" of strategy. Eds. 6. Compare On War, Book I, ch. 1, sections 25 and 26 (pp. 87-88). Eds. 7. "Zwei Briefe des Generals von Clausewitz: Gedanken zur Abwehr," special issue of the Militärwissenschaftliche Rundschau, March 1937, 5-9. 8. The editor of the German text points out that it is Roeder who calls an Austrian advance through Lusatia on Berlin the most dangerous threat to Prussia. See p. 22. Eds. 9. During the Seven Years War Berlin was briefly occupied, once by the Austrians, once by the Russians. Eds. 10. As will be seen, Clausewitz does not mean he will test M's solution against historical examples, though his discussion does occasionally refer to incidents in the past. He is here using "historical" in opposition to "a strictly logical," i.e., theoretical, refutation, to signify a realistic, concrete analysis of M's "individual points." For Clausewitz's belief that history, as the reflection of reality, is the only valid basis for a theory of war, see the statement in his letter to Roeder above, p. 8, and many passages in On War, for example Book II, ch. 6 (pp. 170-74). Eds. 11. The comparison with games points to the belief that the cardplayer tends not to play his best cards at once, but gradually in the course of the game. Ed. of the German text. See also the discussion of Clausewitzs essay "On Progression and Pause in Military Activity," which compares gambling and war, in Peter Paret, Clausewitz and the State, pp. 361-62. Eds. 12. The reference is to the danger that according to M a siege of Torgau constituted for Prussia. Ed. of the German text. 13. This seems to refer to those cases in which it was important to occupy a significant area and establish defensive positions there before the enemy could do so. Ed. of the German text. 14. M wrote "at the Prussian border." Major von Roeder's solution (p. 15) counted on the possibility that the enemy would cross the Elbe in the vicinity of Dresden. Ed. of the German text. 15. In this passage M did not refer to "the most disadvantageous defensive," but to Prussia being "thrown ... completely on the defensive" (p. 18). That difference does not, however, affect the sense of Clausewitz's argument. Ed. of the German text. 16. Clausewitz writes "venn ich dazu berufen ware" -which means either "were I competent to do so," or "were I called upon to do so." Both versions are possible, though the latter seems close to a tautology: "I should feel obliged to attack [the argument] were I called upon to do so." It seems preferable to interpret the statement as an expression of Clausewitz's habitual courteous self-depreciation. Eds. 17. That Clausewitz, having demolished M's solution, can claim he agrees with him perhaps more than with anyone else, may seem strange. In part, the statement is a further expression of the polite, unassertive manner that he habitually assumed toward his subordinates. But his overt tolerance covers a good measure of sarcasm, and probably also a rejection of the conventional military judgment of the day, which Clausewitz considers so inadequate that even an M might not be the most competent strategic analyst. Eds. 18. Apparently Clausewitz is again referring to the absence of specific information on the political situation, which alone would determine whether an advance through Lusatia would be appropriate. Ed. of the German text. 19. Roeder makes no provision for uniting the Görlitz corps with the main Prussian Army concentrated northeast of Hoyerswerda, rather this corps would be forced northeast into Silesia. Eccentric deployment is the same as divergent deployment, i.e., away from the center. See On War, pages 367-369. Eds. 20. Clausewitz writes "Parteigänger," who might be either elite regulars -Jäger (rangers) or Schützen (sharpshooters) - trained in detached, small unit operations, or regular line infantry and light cavalry used for this purpose, or irregulars. Eds. 21. Numerals in parenthesis in Roeder's text were added by Clausewitz. His respective comments are similarly identified. Eds. 22. This sentence introduces a characteristic example of Clausewitz's dialectic method of analysis. Eds. 23. To convey Clausewitz's meaning in this paragraph, a very free translation of the final sentence seems necessary. The German reads: "Der Grund, dass sie dann ihre Kommunikationen aufgeben wurden, bezieht sich auf das Vorbeigehen oder Herausmanovrieren, welches ich eben als untuhlich gezeight habe." Eds. 24. Vladimir is about 150 miles east of Moscow on the road to Gorki while Kaluga is about 100 miles southwest of Moscow. By placing his army at Kaluga, Kutusov was in a position to threaten Napoleon's line of retreat from Moscow. This maneuver also tended to concentrate Kutusov's army with Russian forces operating south of the Konigsberg-Vilna-Smolensk-Moscow line, a move to Vladimir would have continued to drive major Russian armies apart. Eds. 25. See On War Book Six, Ch. Four, page 462 for Clausewitz's discussion of lines of communication. See also Erich von Manstein's Lost Victories, Henry Regnery Co., 1958, for WW II examples of divergent lines of operation; p. 291, pp. 368-369.
pp. 369-370 for an example of oblique lines of communication for German forces in southern Russia. Eds.